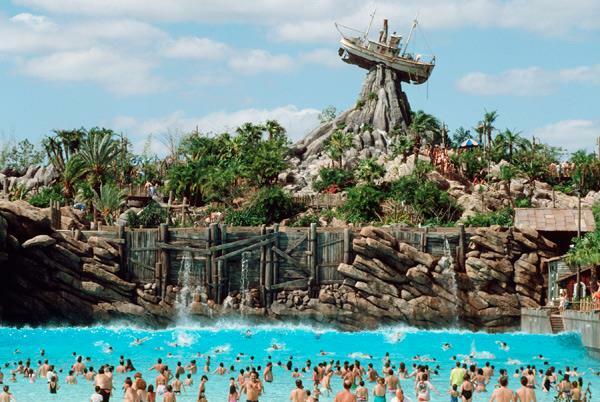 There’s no better way to escape the heat of the summer than by visiting one of Orlando’s many water parks like Disney’s Typhoon Lagoon. But sometimes in your excitement to spend the day splashing in the pools, sliding down thrilling rides and wading in lazy rivers, you may not properly pack for your water park day. Unlike packing for a day at the beach, packing for a water park isn’t so extensive. In fact, you don’t need nearly as much as you may think! Thanks to certain things like towels rentals, you’ll be able to get away with just one bag to get you through the day. Change of clothes – After a long and wet day at the water park, you may not want to sit in your bathing suit for your entire ride home. If so, I recommend bringing a change of clothes. Keep your dry clothes in the locker, so you don’t have to worry about them getting wet or wrinkled in your bag. Soap and Shampoo – In the same sense that you may want to change out of your wet bathing suit before heading home, you may also want to wash the chlorine out of your hair as soon as you can. Like many Water Parks in Orlando, Typhoon Lagoon has locker rooms and showers, so make sure you bring a travel size of shampoo, conditioner and soap to rinse off before heading home. Your hotel toiletries work well for this plan. I recommend taking a shower after the park closes; that way you made use of a full day at the park. Also, Typhoon Lagoon has a very spacious shower room with private shower areas, so it’s real convenient. Plus, you can save a lot of time showering at the park and opting out of a return trip to the hotel. Besides, you’ll be pretty hungry after a day of water park fun, so grab dinner immediately afterwards at Downtown Disney and feel spick and span. Sunscreen – It almost seems like a no-brainer but often times the sunscreen is forgotten after you first apply it at home. Make sure you pack sunscreen and reapply often while out in the hot Orlando sun. That’s the trick. Note: If you do get sunburn, the best way to ease your burn is with some aloe vera, but apply it generously, often, and immediately. Aloe is good to bring on a Orlando trip, especially during summertime. Snacks – Of course you can always buy a snack, lunch or sweets at the water park’s many restaurants, but if you’re looking to save a buck or two feel free to pack your own snacks. Many of Orlando’s water parks will let you bring in your own food so make sure you take advantage! It’s also a good idea to eat a good Breakfast before entering the park; you don’t want to get hungry early. Water – There’s no denying you’re going to get thirsty during your day of lounging and splashing in the sun, so make sure you have enough water on hand to keep you hydrated. Again, you can always buy water at the park, but it’s best to have your own so it’s readily available when you need it. Rent a locker for the day and every time you head back to the locker to reapply sunscreen; load up on some snacks and water as well. Towels – A few of the things you don’t need to bring with you include things like towels. Yes, towels! Most water parks let you rent towels for the day for a small fee. This is convenient as towels are bulky and take up a lot of space on your bag. After you’re done with the towel, chug it into one of the Typhoon Lagoon bins and forget about it. You don’t need a dirty towel in your car anyways. Floaties – If you’re traveling with children, they might not be the best of swimmers yet, but you can leave your floaties at home. Typhoon Lagoon has life vest anyone can borrow for the day and this one is FREE. There is no charge for life vests at Typhoon Lagoon. Now that you know what to bring and what not to bring to Typhoon Lagoon, all you need is to decide when to go. Luckily, Orlando weather is pretty warm all year round, so there’s no excuse not to spend a day at the water parks. Add the Water Park Fun and More to your Disney World Ticket and make a splash at the water parks!